In the eyes of the ruling elite, arable land remained the basis for all wealth. Agricultural land was held collectively by local districts, or owned by public institutions such as temples, or by the city itself. There was no individual ownership, but instead there was a collective with individual rights. The collective was called a calpulli. The individual could work the land for a lifetime and leave it to his sons upon his death. If a man did not work his land for two years he was severely admonished. Then, if he didn't work the land for a third year it was taken away from him and returned to the calpulli for redistribution. The same thing happened if the family died out. The calipulli also rented land to people who did not live in their district. The earliest Aztecs loved growing flowers in their gardens, on their rooftops, and in the courtyards of their homes. At this time most of the tools they used were primitive and made out of wood. The Aztecs grew corn, sweet potatoes, onions, peppers, tomatoes, beans, and squash in chinampas and on the lakeshore. Chinampas were gardens that floated on the lake. They were important because when the Aztecs arrived in the Valley of Mexico the area was heavily populated without any available farmland. 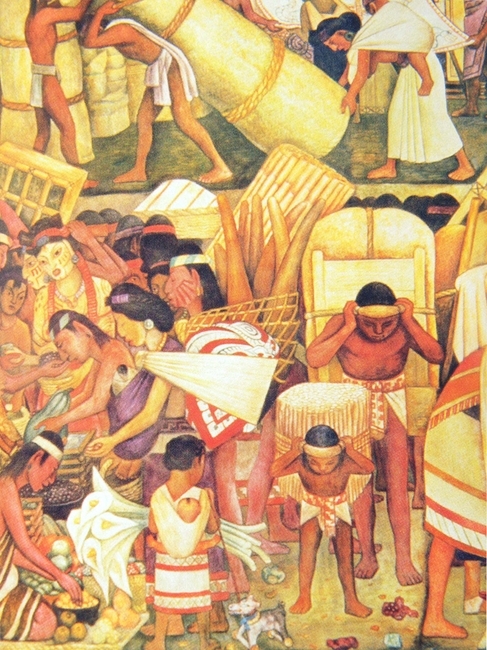 People working in canoes tended to the chinampas. These floating gardens were constructed by by piling mud from the bottom of the lake onto wicker-work rafts. Once planted, they were amazingly productive. In addition, the Aztec's loved hunting birds and fishing. The hunters used bow and arrows, and the fishermen used spears and nets. The workers who cultivated on the lakeshore used digging sticks and wooden spades. The Aztecs two sources of meat were the domestic turkey and dog. Turkey was called uexolotl and it was a native of Mexico. The dog they ate was a hairless variety that the Spanish conquistadors described as mute. The Spaniards stated that the Aztecs fattened the dogs up before eating them and that at mealtime they were served both turkey and dog on the same plate and many enjoyed it. The custom of eating dog died out after the Spanish introduced cattle and other domestic animals. At this time, Central Mexico was also rich in wild game such as deer, rabbits, and wild pigs. Birds such as the pheasants, dove, and crow were also hunted lakeside. The Aztec's cultivated anything that moved in or on the lake. This included frogs, fresh water shrimp, and aquatic larvae. The eggs of the water fly called ahuauhtli were collected and eaten like caviar. Famines occurred often, and their agricultural techniques were defenseless against locusts invasions, rodents, snowfall, and flooding. In times like these great shortages would occur and people would be forced to forge for wild plants. Shortages began occurring regularly so the Aztecs implemented a program of granaries to cope with the shortages and ward off hunger. However, in the worst of times even these supplies could be exhausted.